BMW has evolved the 3 Series into a true "series" with the introduction of its new 3 Grand Turismo. No longer just a sedan, wagon, and a coupe – in fact the coupe has been kicked up to what will be known from here forward as the 4 Series, the 3 is now all that and can be had in jumbo size as well. Like its big brother the X 6, the look of the new 3 GT is that of a round-rear, bulked up vehicle that neither fits the sedan or wagon moniker. It is a 4-door, coupe, hatch-back. From this writer’s point of view that is a good thing. Sedan’s make very little sense anymore given the variety of body styles now available. In addition to a new look the 3 GT is a legitimately much larger vehicle. 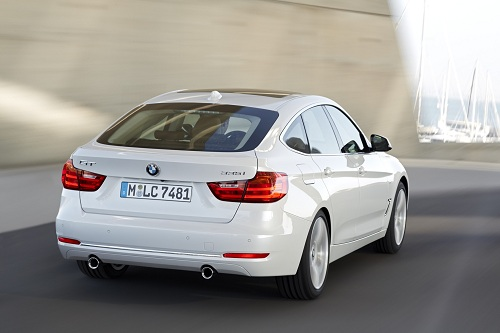 The BMW 3 Series Gran Turismo was designed to be a long hauler. With that goal in mind BMW has elongated the already good-sized 3 by 7.9 inches. Not 7.9 more than the sedan. 7.9 inches longer than the wagon. The vehicle's wheelbase has been stretched by fully 4.3 inches. It has also added 3.2 inches of height. Yes, the platform and many of the parts will remain the same as a 3 Series, but these changes render this a completely different vehicle. The new beefy 3 GT will also have a lot more storage capacity for ski weekends. BMW says in its press release (written in Germany apparently) that the storage area of the 3 GT is larger than the 3 Series wagon by 25 liters. That sure sounds like a lot of liquid doesn’t it? Translating that to Imperial units the exact addition of cubic volume is “a whole bunch.” Snowboards (and skis for the old folks) will fit inside nicely. The rear seats fold 40/20/40 – exactly like Torque News suggested any great winter car’s seatbacks should fold! When in use the “20” section allows snowboards or other long items to come forward from the center of the storage area, but still allow 4 passengers to tour in total comfort. The headrests also fold out of the way, which means that the driver will actually be able to use the back window – as a window. Speaking of rear seats. No longer will the driver of the 3 have to ask “Do you have enough room back there” as the teens slouch into their spots. With almost 3 additional inches of legroom, Stretch and his little brother will no longer have to sit up straight. Kidding aside, the new 3 GT will indeed be a very comfortable 4 or 5 passenger long distance vehicle with luxury and comfort rivaling mid-size luxury crossovers. The rear seats can also be adjusted for rake, tilting back, or going vertical to suit the needs of the moment. A one touch mechanism also drops the rear seat backs to turn the 3 GT into a cavernous 2-seat crossover. BMW’s engineers clearly put a lot of effort into making the new BMW big-gulp 3 GT have the look of an espresso cup. Although the vehicle exudes masculinity and has a bit of the bulldog stance that the X6 sports, the vehicle uses lines and curves to trick the eye and make the 3 GT look not so much sleek, as “cut-up” as the gym rats like to say. Due to the added vehicle mass, there is no longer a need for frames on the windows. That is particularly nice on temperate days when the windows are down and the doors swing open. No more bending around the door frame. Ease of entry and exit will also improve due to the seat's higher hip-height. Deep lateral cuts low on the doors give the car a look of motion. The front end gets what used to be the M look, but has now migrated to many BMWs of lesser breeding. Yes, there are what used to be called “kidney grills”, but our own Don Bain rightly points out that they are not shaped like any organ of the human body anymore, so we will call them instead BMW grills. There is an active aero wing on the back which will add pizazz and also some downforce at the needed moments. Up front the new wind-cheating elements are called air curtains (openings in the front air dam near the sides of the vehicle) and air breathers (indents behind the front wheel wells). BMW’s press release was long on detail regarding the 3 Gran Turismo’s equipment list. We could recount all of that for you here, but it does not differ from the current 3 Series sedan. There will be both the 2.0 liter turbo engine, called the 328 (strictly for old-time sake since the numbers are now meaningless) and also the 6 cylinder, in-line engine, also turbocharged. Power will be 240 or 300hp and coupled to the company’s 8 speed automatic transmission will result in good scoot. Interior dash and infotainment will be the same as the current 3 Series. BMW will introduce the new 3 Series Gran Turismo with three individual trims. First, there is the Luxury Line. This trim could have been called the Chrome Line as it is identifiable primarily by chrome trim used externally such as around the B-Pillar. The wheels of the Luxury line are multi-spoke alloys and available in 18 or 19” diameters. Next is the Modern Line. This trim is defined by turbine style alloy rims. Inside a light dash is offset by a dark wheel. Pearl effect chrome sets off the color interplay. There will also be an M Sport trim. The M will not have any separate engine modifications, but all the other M equipment is there. A lowered suspension, the tough M style wheels, and an added aero package to complete the “lowered to the ground” look. Of course the special M blue metallic paint is reserved only for this trim. The all-new 3 Series Gran Turismo compliments the growing line of 3 Series variants. Taken in context this may be one of the best-selling, and most longed-for new 3 Series vehicles in the coming year as the relative affordability of the 3 Series platform and much-loved looks and functionality of the X6 merge. This story on BMW 3 Series Gran Turismo was updated on May 11, 2018. Interesting story and you got me hooked until I reached the ski part. Skis my friend are not for old folks anymore. Apparently, snowboards are out and skis are in again. As someone who has done all skiing modes, snowboard, skis and mono-skis since the 80s, I can tell you I'm happy about this. Now add to this a car that can haul all of my snow paraphernalia and still offer a decent drive... hum, this cold be fun, although I'm not won on the design, but that's a personal taste thing. Thanks for reading. I will have to find a generic "Snow sports" expression I think. My 13 year old rolls his eyes and says "Dad, nobody skis anymore" when I ask him how Ski club was. Glad to hear the classic method is still alive. Alive and kicking. I even tried monoskiing a few years back and the national US team was a lot of fun.